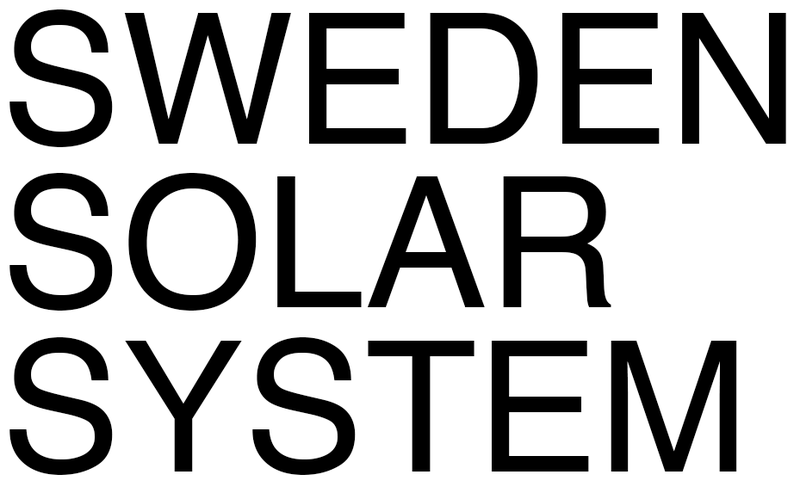 The Sweden Solar System (SSS) is the world’s largest model of our planetary system. 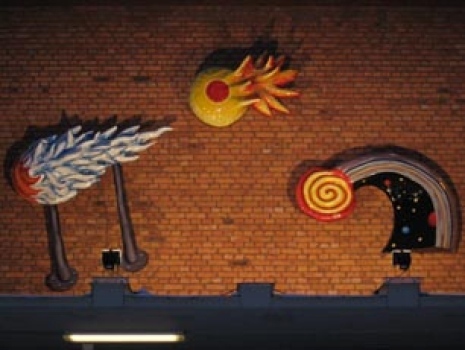 The Sun is represented by the Globe in Stockholm, the largest spherical building in the world, and the planets are lined up in direction north from here. 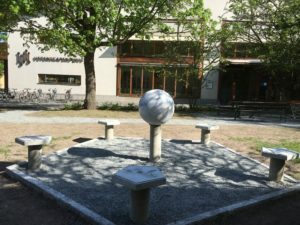 News: The model of Mercury, which has been stored for some time during reconstructions in the area, is now exposed again and can be visited from April 27 2019 outside the City Museum (Stadsmuseet). The Globe Arena in Stockholm is the largest spherical building in the world, and it represents the Sun in the SSS. 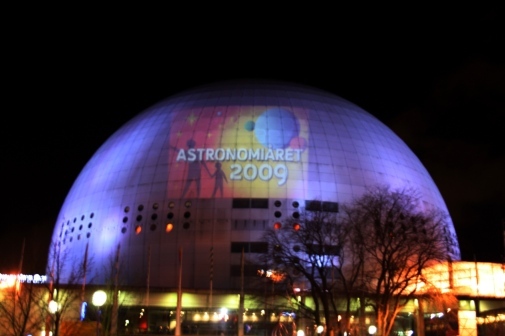 This picture shows the Globe lit by an animation, which included a sequence showing flares on the solar surface, during the inauguration of the International Year of Astronomy 2009. 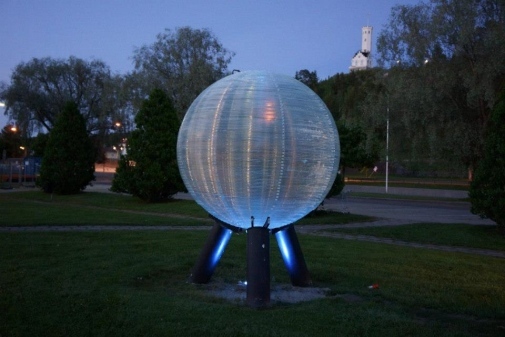 A new model of Venus was inaugurated on May 9, 2016 in the park outside the House of Science (Vetenskapens Hus), AlbaNova University Centre, Stockholm. The model is sculpted by Peter Varhelyi, and on five plates surrounding the model are schematic descriptions of: Venus in the sky as morningstar, Venus in its orbit, Venus’ phases, the greenhouse effect on Venus, and names of the goddess of love from different cultures. The Observatory museum in Stockholm is closed, and its Venus model has been moved to the upper floor in Vetenskapens Hus. The models of our planet Earth and the Moon are located outside the entrance of the space theatre Cosmonova at the Natural History Museum (in the ticket hall). The model of the Moon is made by Peter Varheyi and is situated on a pillar 20 m away from the model of the Earth. 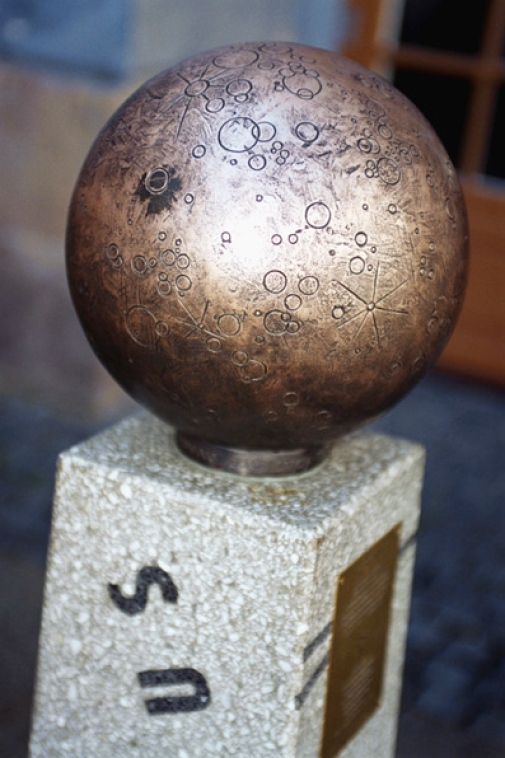 Mars is connected to a plate in steel symbolizing the Earth. Chemical symbols for common compounds on Mars can be found on the sphere. 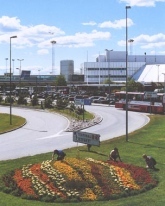 Jupiter was previously represented by an arrangement of flowers outside Sky City at Arlanda Airport. Plans for a new 3D model at another location are advancing. The plans to create a nice model of Saturn are advancing. 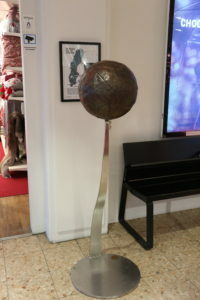 In 2010 an artistic model of the moon Titan was inaugurated in central Uppsala at the Celsius House, where the 18th century astronomer Anders Celsius worked. In addition, several Saturn moons have been given form by pupils in school classes in the area. 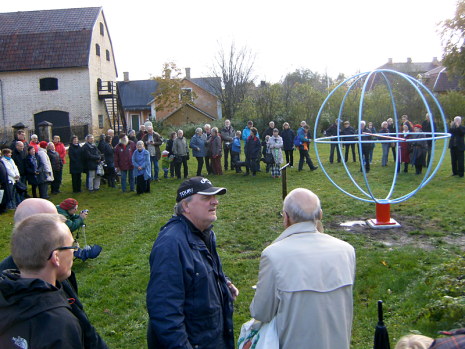 A symbolic and playful outdoor model of Uranus was inaugurated in Oct 2012 (see picture) in Lövstabruk south of Gävle. The model was built in steel by Forsmark Mechanical Workshop at the Forsmark nuclear plant located close to Lövstabruk, and where the element Uranium plays an important role. The unusual tilt of Uranus’ axis is marked. 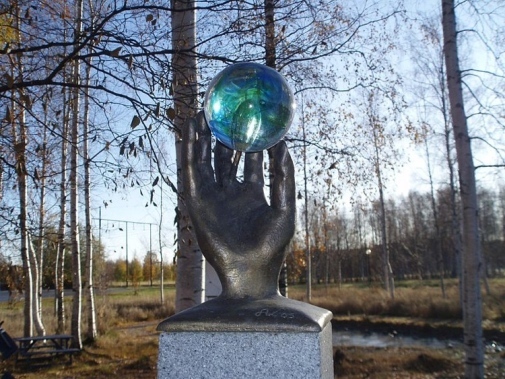 Neptune, symbolizing the god of the water and the sea, is located in the central park of Söderhamn, a coast town with long traditions of fishing and sailing. The model is lit from inside by blue light in the night. Pluto and Charon are supported by two tomb-like pillars reminding of the mythological meaning of Pluto (Hades), the god of the underworld. One can also be reminded of the meteorite impact that took place here 90 million years ago, when all life became extinct over a large area, and from which the Dellen lake system formed. Pluto is not classified as a planet anymore. It is a dwarf planet. Eros, the god of love, was inaugurated on a Valentine’s day during a close encounter by a NASA space probe. 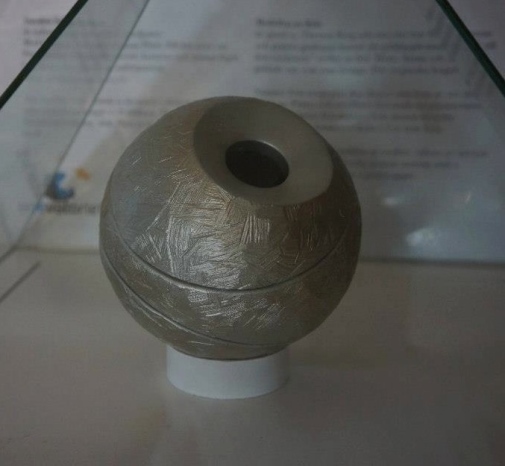 The model, only 1.5 mm in size, was designed and exhibited as a school project. 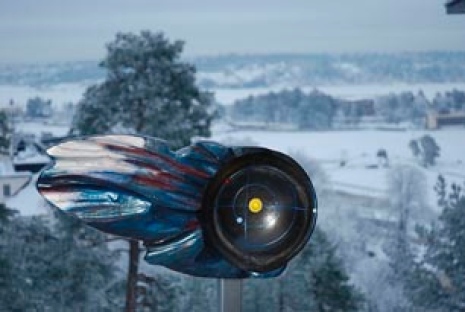 A sculpture of an asteroid discovered by A. Brandeker in 2000 with a telescope at the Stockholm Observatory, now ”Kunskapsskolan”, was unveiled in 2010. 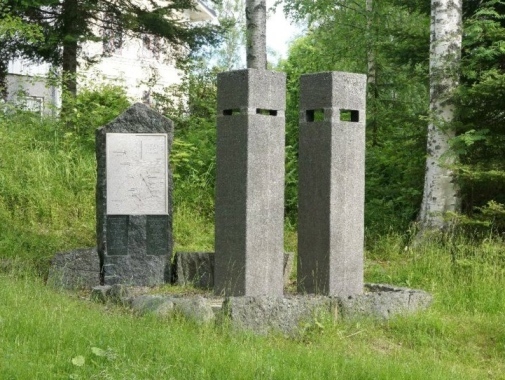 The object was named “Saltis”, after the nickname of Saltsjöbaden. 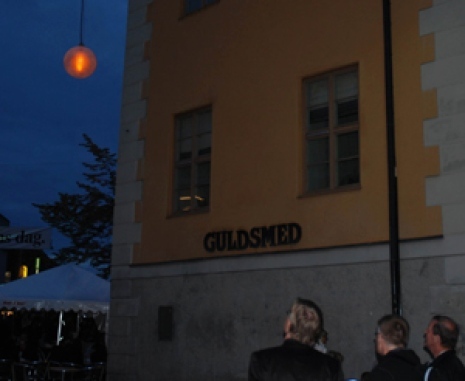 Picture from the inauguration of on Sept. 6, 2017, when the initiator Åke Dahlöf (teacher at Åva senior high school) put candles into the sculpture (Vesta was the goddess of the hearth in Roman religion). To the right Peter Varhelyi, who sculpted Vesta. 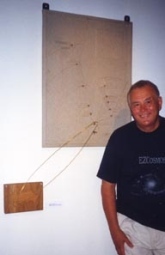 Below a sketch of the panels forming the base showing antique symbols for Vesta and the Vesta family, a collection of smaller blocks that were ejected from Vesta after a major impact at the southern pole. The model is oblate, about 3 cm across and with a crater landscape on its surface. 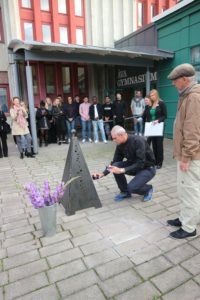 The asteroid Palomar-Leiden 5025 is a small dot on a relief describing SSS and placed in a park in Knivsta with “cosmic” sculptures by Eric Ståhl standing in front of the relief. The dwarf planet Quaoar was discovered in 2002 by the american astronomers Chad Trujillo and Michael Brown. Quaoar was the creator in the minds of the Tongva people, who lived in the area around Los Angeles (USA). 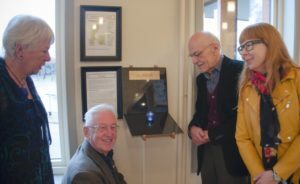 The model of Quaoar, created by Poul Jörgensen Kastlösa Glasbruk, Öland, was inaugurated on November 18, 2017, in Gislaved’s library (right image). 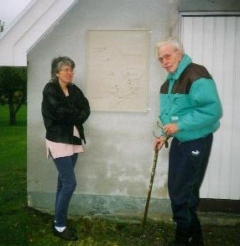 The project was iniiated by Gislaved’s Astronomical Society Orion. Ixion is one of the largest minor planets discovered by a team including Swedish scientists. 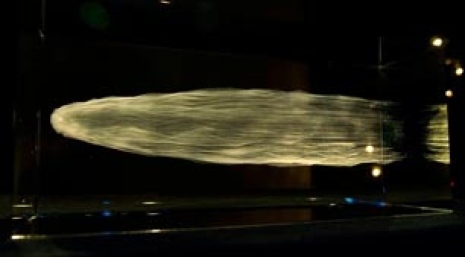 The model is shown in the science centre Technicus in Härnösand. Makemake is named after the God of creation on Easter Island, and is the third largest dwarf planet in our solar system. It is located in Slottsskogen in Gothenburg, not far from the famous Easter Island tree in the Botanic Garden. The model is designed by Katja Lindblom to the right on the right image In connection with the inauguration on September 23, 2017 by John Conway (left), Director of Onsala Space Observatory. 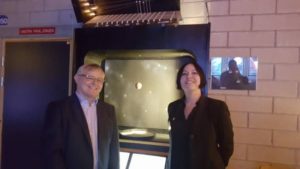 To the left a photo (by Halvard Nilsson) showing ‘Oumuamua as it looks through the telescope seen on the right image where Charlotte Helin, chairman of the Astronomical Society of Halland, demonstates during the inauguration in 2018. ’Oumuamua is the Hawaiian name of a stony, elongated interstellar object once formed around a distant star from where it was ejected. On its journey through the Milky Way it happened to cross our solar system. It paid a visit to our neighbourhood in 2017 and is now on its way out again. 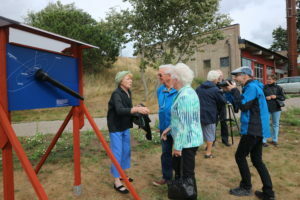 A presentation of this unique celestial body was inaugurated in August 2018 in Plönninge, Halland with a model created with the support from the Astronomical Society of Halland. 2007 OR10 is one of the largest dwarf planets and located in the Kuiper Belt about 80 times further out from the Sun than our Earth. The diameter is about 1500 km and the colour is red. The orbit is strongly eccentric and it takes 500 years to circle the Sun. 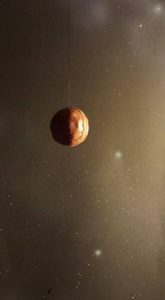 The model of the dwarf planet and its moon was created by the artist Stefan Agnani and the inauguration took place on Septemeber 23, 2017, when also the discoverer Megan Schwamb participated via skype from Hawaii. The model of Eris, the goddess of conflict, reflects an ancient story when Eris initiated a big quarrel starting with a controversial inscription on a golden apple. 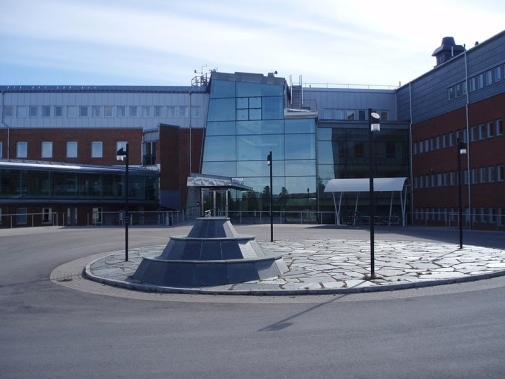 Comet Halley was inaugurated at the science centre Balthazar in Skövde on December 2009. 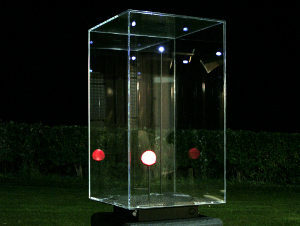 Halley is prepresented by three outdoor models inspired by drawings made by school children, and in addition one indoor model formed by laser in a block of glass. At this place the comet is at its largest distance from the Sun. 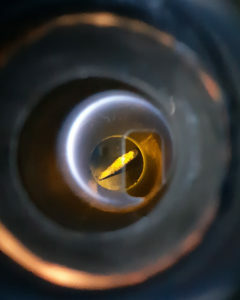 Swifft-Tuttle has an elongated orbit, and in SSS the comet passes at its largest distance from the Sun (aphelium) at this location in the science centre Kreativum on the Swedish southcoast. 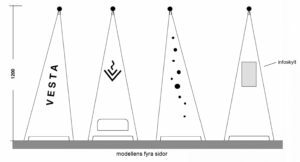 The distant interface between the solar wind and the surrounding galactic gas, the terminal shock, has been manifested in Kiruna. A future sculpture is envisioned to express this phenomenon reminiscent of aurorae frequently seen in northern Sweden.